This week at the gallery we’ve been accepting submissions for “LINE BY LINE: Student Drawing Exhibition”. This is the first time that we’ve hosted a student exhibition which was an open invitation to all students here at Wellesley College. I’m excited to have the opportunity to see the enormous range of subjects and approaches to drawing all in one show. We had a huge turnout for the show, over 60 submissions total. The show will be installed on Monday with an opening reception scheduled for Thursday, Nov. 5 from 4:45-6pm. 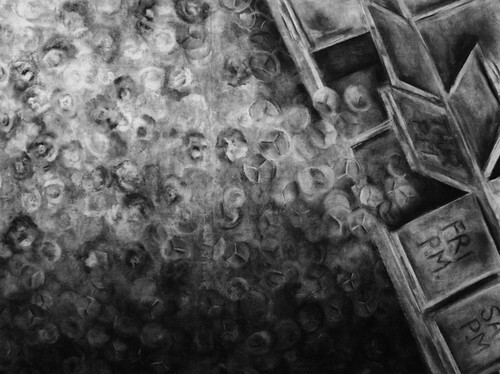 “Acne, Year 6″, charcoal, 36″ x 48”, by Katie Simpson, Class of 2012.